I spent 6 hours on the road yesterday day bringing our new dog to school. It was a great distraction and I am getting excited to bring him home after his training at TrailRunners. He will be finished 2 days after Christmas, so that will be my gift this year. The boys are excited to have a new friend to play with out here, and I will post pictures then. In spite of that, I finished up the tutorial, and here it is for you. You need 2 sheets of 12 X 12 CS and a scrap or DSP at least 6 inches wide to start with. Cut one of the sheets into 5 X 12 and 4.75 C 12. The left over strip will be the band. Then cut another 4.75 X 12 strip off of the other sheet. That left over piece is not needed, and it can go back into your scrap folder. Score the 5 X 12 piece at 2.5, 3, 8 and 8.5. Fold as pictured and this becomes your album cover. Take the two 4.75 X 12 pieces and score them at 4.75 and 9.5. Then fold them as pictured and lay them out on the largest middle section of the cover. It will be a little big and you may have to trim a smidgen off of the two smallest portions on these pieces. When you glue them on, they should be just shy of the edge. hat way, when you fold them in, they won't hang out of the completed album. I trimmed a little more than was necessary, as you can see by the gap after I glued it, but that is not a big deal, since that will be covered with your mat, and photos. The you can glue the DSP to the front bottom flap of the cover - this will be the biggest flap. Now it is time to make your and to hold it altogether. Score the narrow strip that was left over at 1.5, 2 1/8, 7 1/4, and 7 7/8. Each score mark gets bigger by 1/8 of and inch to make room for the expanding that will occur when you add your photos and embellies. Then add a bit of glue to the edge and adhere. Try to make it as square as possible, so it fits nice. Be cause of the added room, this band will be a little loose until it is completed. Here are the shots of a couple finished ones. Another masculine version. Here is the inside of a finished one. Please link back here after you make them, so I can go and check it out! Tootles, have fun and happy scrappin'. The one problem I have with mini abums is the smaller size pictures. I designed this one for my last class, and you can have 4 3/4 x 4 3/4 photos if you wish! This is the tutorial that I am working on, but I am going to show you the finished project. There are no embellies, since I made them for the boys to carry around. This is what it looks like closed. The band holds it together, but you could use ribbon or anything else of your choosing. 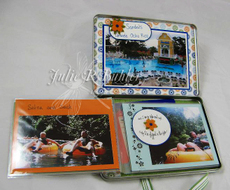 It is an accordian style album, so each side opens opposite of the other. Here is is all opened up. You have room for 5 or 6 big pictures. 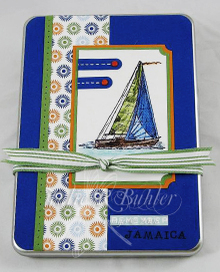 You can use the top flap for a title or your journaling. You can even add more pictures to the back of them, if you should so desire. Tutorial is ready for you! I decided to get a jump on Father's Day for everyone. We made these at my last 2 classes and they were a HIT !! We used my Accordion Card Tutorial to put everything together. I used the Bella Bleu DSP(#113974) for the background and the CS colors are not quite navy, brocade blue, barely banana, and white. The stars are from the Large Star(#110710) and Star(#109045) punches. The ribbon is very vanilla grosgrain(#109026) and the brads(#104336) were added for extra oomph. Here it is all opened up. I used some retired star stamps and the punches for embellishing. The boys initials were cut out using the Big Shot(#113439). A coupe pictures I rounded the corners and the others left square. This is my idea of a great scrapbook, because you can have it finished in the course of 1 hour!! Here is a couple close up shots. You can click on each picture for a better view of the things I added to each particular page. I posted this now so you have plenty of time to get yours done *wink, wink*. Canadians can buy the products mentioned in my online store that links in my signature below. Tootles, have fun and happy stamping!! Well, after I made this card HERE, I was asked a few time about a tri-shutter album. So I looked it up in the Splitcoast gallery, and saw a couple in there. I figured out how to make them, and here it is! It is actually super easy! The hardest part was finding pictures for the smaller squares. The middle section, though, can fit a full size 4 X 6 photo! The smaller ones are also great for journaling and embellishments, which I didn't add too much of, since this is not a really feminine album. You can click on the pictures to see them larger, and I am in the midst of trying to get a tutorial together for you all to create your own Have fun and happy stamping!! DVD Tin Scrapbook - Video Tutorial !! I have been working really hard lately, but not on many things, just one! I finally finished my first scrapbook! I started it over two years ago, trying to get my YWAM pictures all in one place. It was put on a shelf, like the back shelf, forever, but since meeting a few school mates on facebook, it got me motivated to complete it. HERE is the point I had gotten to last time, and so I had way more pictures in the second half than the first. I showed it to my MIL last night and she really liked it. To me, that is HUGE, since she has been scrapbooking almost her whole 76 years, I think...LOL. These are a few pockets I made from the pages, to hold momentos and such. This is an entirely Stampin' Up! scrapbook, have fun and happy scrappin'!! 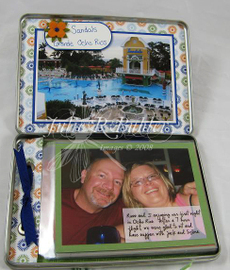 This is the first album I made, since I wanted something quick and easy to scrapbook our trip to Jamaica. This one is more like a scrapbook, than just an album. For this one, I used Jersey Shore DP, and the coordinating CS for the inserts into the pages. I did journaling right on some of my photos, but also added embellies, rub-ons, adhesive die-cuts, etc, for a more of a scrapbook feel. This one also has more pages, I used 10 for it. Now for the class information. The price will be the same for everyone, except when it comes to the shipping. For the class kit itself, the cost will be $12. This includes a choice of 3 different designer paper, plus the 10 matching CS inserts, the pages, coordinating 5/8 grosgrain ribbon(1 foot), and 2 jumbo eyelets. You provide your own photos, and any added embellishments. It will also come with step-by-step instructions, so you can put it together, as soon as you get it! Air : $8.00 - This is the cheapest, but it is not traceable or insured. You pick this choice at your own risk. I will not be responsible once it leaves my house. Expedited : $15.00 - This one is traceable and insured, the best way to get your class kit. The final option is a class in my home!! There is no shipping costs for this, but there is a limit of 10 per class, and the cost is $15, which includes light refreshments. This will be in the beginning of June. When you email me, you need to let me know what your address is, your choice of shipping, and which DP you want. Here are your choices : Jersey Shore, Flowers For You or Spring Silhouettes. 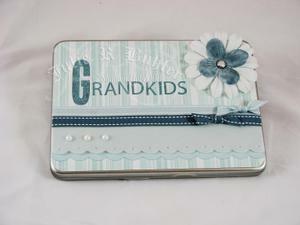 These would make great gifts for grandparents, or even for a graduate!! 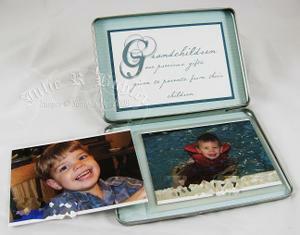 Put all the grad memories together, or how about for the new mom to keep pictures/keepsakes of her baby's firsts! You will have the instructions after this, so you can make more for each occasion. I need to have everyone signed up by the 15th of May, 2008, so I can order the product. That gives you a week to let me know. I will set up a page specifically for this and you can check out how much you owe when it's up. I am going to keep this as a sticky for awhile, so new posts will be under this one. I am quite excited about this! Everyone was asking me what I was doing with my DVD tins, and now I am ready to share with you. This is the covered DVD tin. You can cover it with anything that you want, the outside for me is easy. I just treat it as a card, put everything together and when it is finished, I glue it on. For this one, I used Soft Sky Prints DP, vellum CS, and soft sky CS. I scalloped the edges with my largest corner rounder (retired), then lined them up, gluing them together. I put it on the DP, and stamped the letters for my word. I added the ribbons to cover the seam, the flowers and the pearls. I used sticky strip to attach it to the tin, so I wouldn't have to worry about it coming off later. Now comes the fun part. IT IS AN ALBUM!! I entered another one like this into a Stampin' Up! contest and an different one yet, to every scrapbooking magazine I could Google on the net. Those ones you can't see, just yet. I am waiting on some news first. I am also going to be offering this as a mail class! I will show you another album tomorrow, and give you the information. Hope you are as excited as I am!